It’s a common problem: your family has grown but your home hasn’t. You could solve it by extending or by upsizing, but both can be costly and disruptive. A third option is to create a garden room: a simple structure away from the house that takes advantage of the space in the garden. 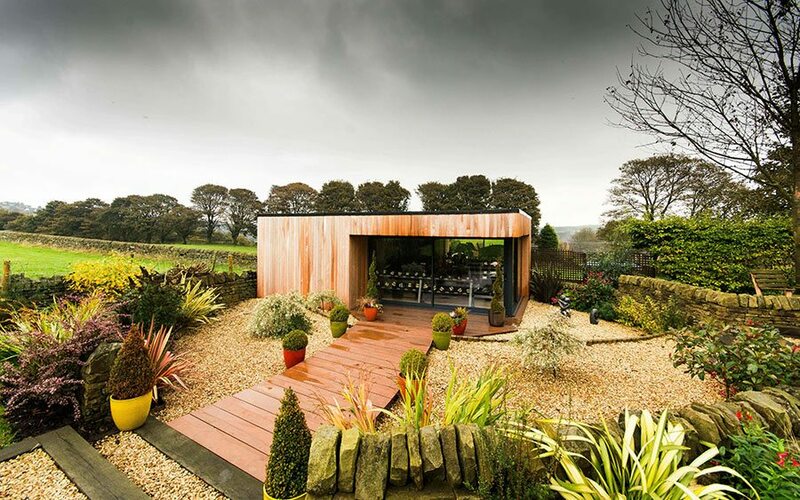 “A garden room will allow you to expand the space in your home without intrusive and sometimes complicated extensions, while simultaneously adding value,” says Rachel Wichall of eDEN Garden Rooms. “It also has the flexibility to become whatever you want it to be, whether it’s extra family space, a quiet place to work space away from the home or a personal gym,” she adds. 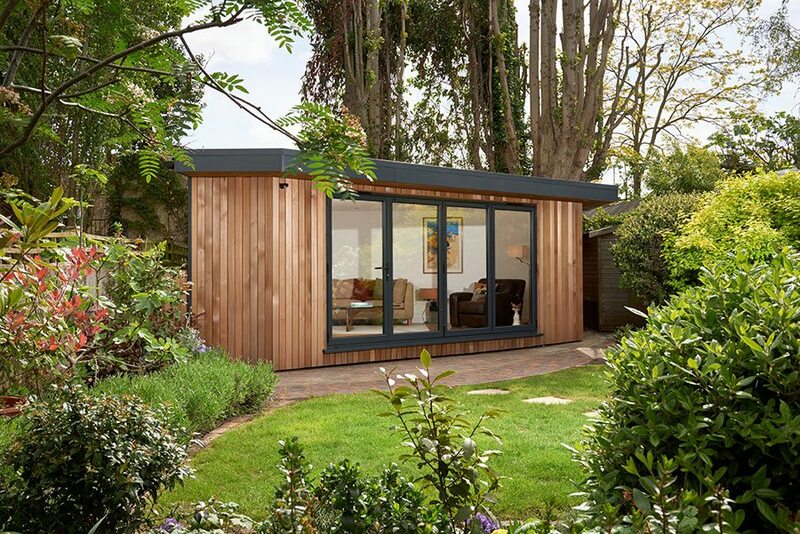 This triangular-shaped garden room by eDEN Garden Rooms was designed to slot into an awkward space. Expect to spend around £32,000 for a similar design. Off-the-peg garden rooms are ideal if you can find a design that fits your space. You can then give it some personality by bringing an interior designer on board. 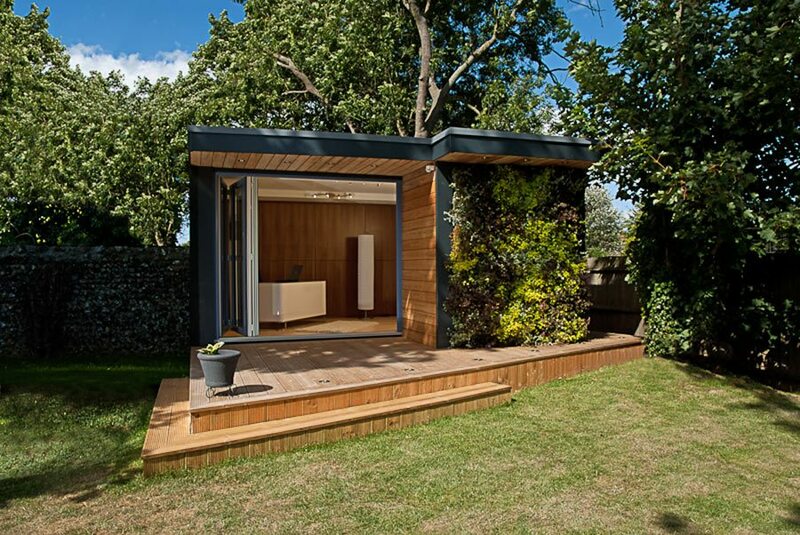 “Use an in-house interior design service that can make your modular garden room feel totally individual,” says Chris Hill of Garden Hideouts. For more ways to add value to your home, check out our expert advise on garden design. 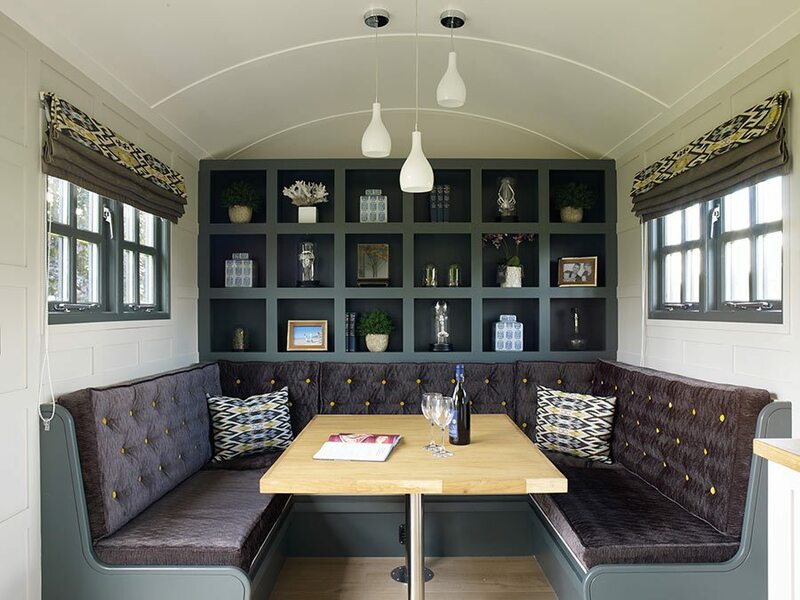 The outside of this traditional shepherd’s hut by Garden Hideouts (£29,950) hides a contemporary interior featuring a seating area that converts to a double bed. Can’t find a size to suit? A bespoke design can be tailored to your tastes as well as the exact dimensions of your garden. It’ll cost more than an off-the-peg design, but it’s also likely to add the value of your home. “When it comes to selling, our garden rooms have a life expectancy of 60-plus years, so they’re a permanent addition to the accommodation,” says Martin Lawson of Swift Garden Rooms. For a luxury garden gymnasium, Swift Garden Rooms recommends extra headroom for weightlifting. Optional extras include a sauna, floor-to-ceiling gym mirrors and a climate control system. The price for a similar building (excluding options) is £43,500. By their very nature, garden rooms are detached from the house. They’re therefore quicker to build and less disruptive than an extension. Martin suggests planning for a two-week build time, although this can be longer if you’re installing a WC or shower. 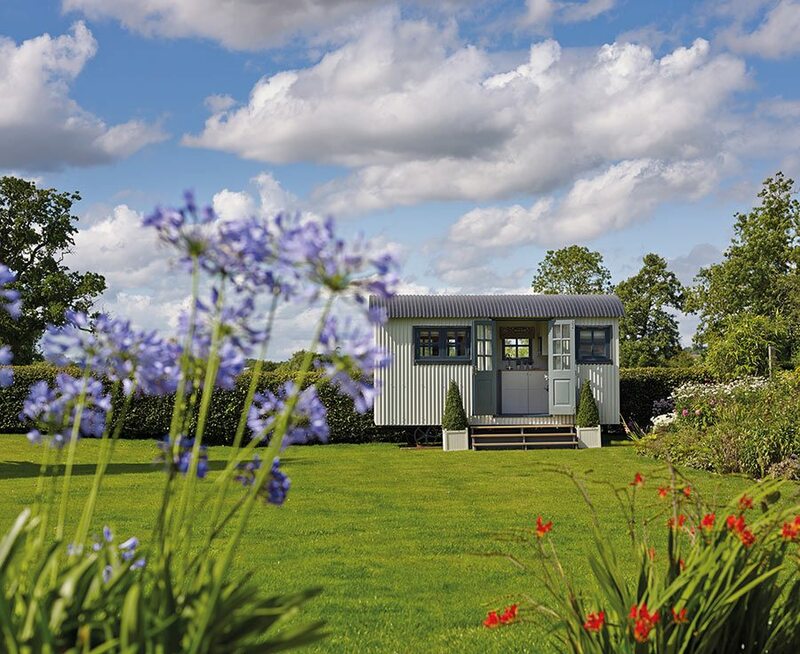 From the bespoke iron wheels to the Farrow & Ball paintwork on the interior, this shepherd’s hut by Garden Hideouts adds traditional charm to the garden. It was priced around £29,950. The majority of garden rooms fall within permitted development rights, so you won’t need planning permission. “You may need planning permission if you want a building higher than 2.5m, or are building in a conservation area or in an area of outstanding natural beauty,” says Rachel. Check with your local council and consult the Planning Portal for guidance. 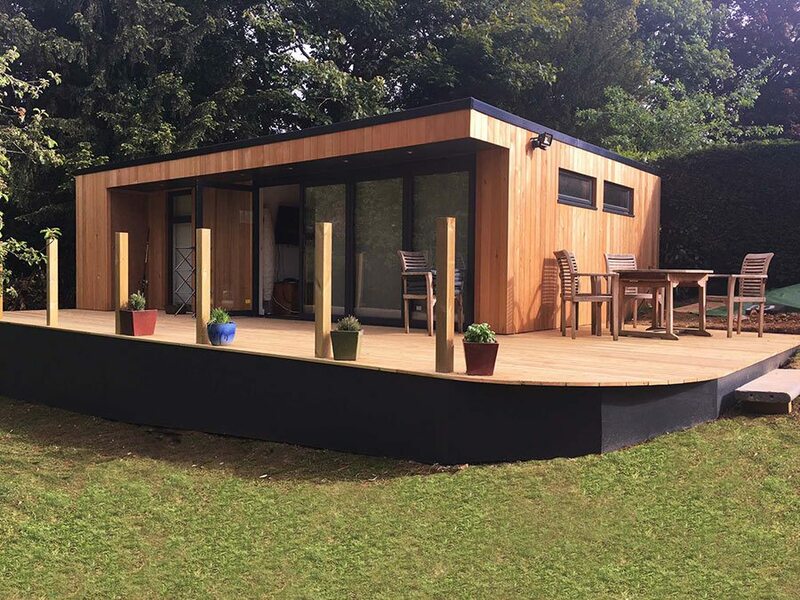 Garden rooms are classed as outbuildings and don’t require building regulations approval if the internal footprint is less than 15m2 and contains no sleeping accommodation. Want something bigger? Typically, you won’t need approval if your proposed garden room measures between 15m2 and 30 m2, contains no sleeping accommodation, is at least 1m away from any boundary or built using non-combustible materials. Garden rooms of 30m2 or more will always require building regulations approval. Electrical work must always meet building regulations. Use an electrician who’s registered with a government-approved scheme to make sure your wiring is safe and compliant. 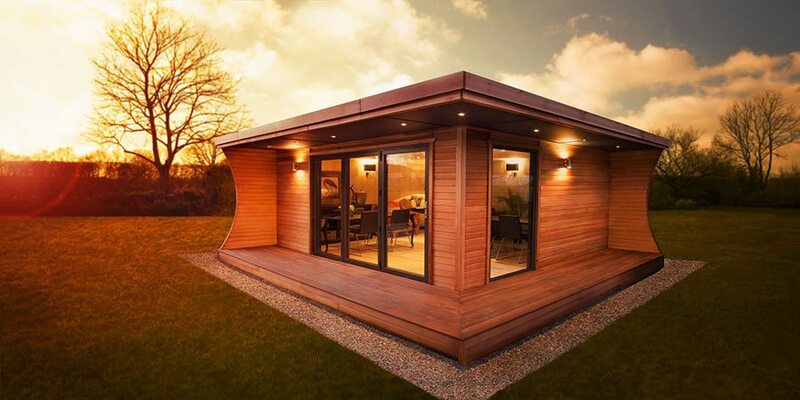 This spacious garden office by eDEN Garden rooms features an en suite wet room and sauna facilities. Sliding doors allow for plenty of natural light. Expect to spend around £35,000 for something similar. Want to know more? Read this beginner’s guide to planning permission. Featuring a wet room, fitted kitchen, large bi-fold doors and extended balcony, this garden room accommodates a retired gentleman with mobility issues. A similar building costs around £74,400 from Swift Garden Rooms. To confirm that your garden room doesn’t need planning permission, you can apply for a lawful development certificate (LDC). 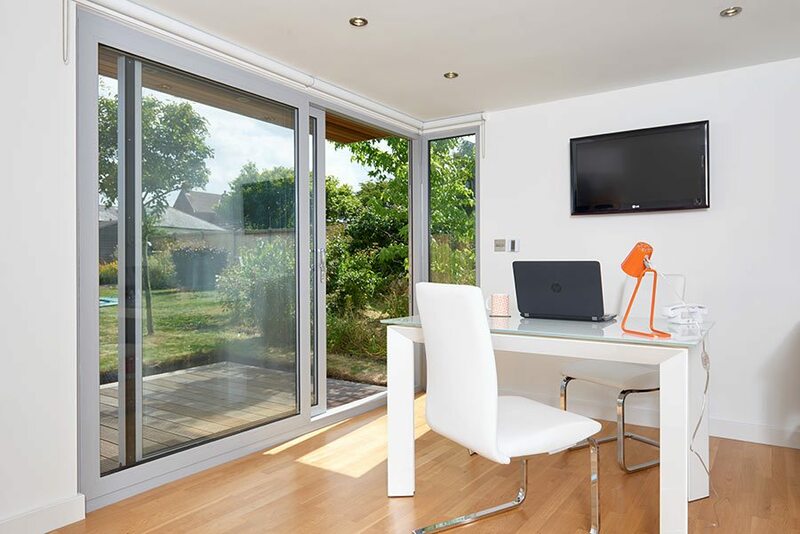 These aren’t compulsory, but there may be times – for example, if you sell your home – when you need a record that your garden room meets all planning rules. Apply to your local council for an LDC via the Planning Portal. The Arca garden room by Garden Hideouts is made of hand-oiled western red cedar tongue-and-groove panelling and features aluminium bi-fold doors. It costs £34,950. 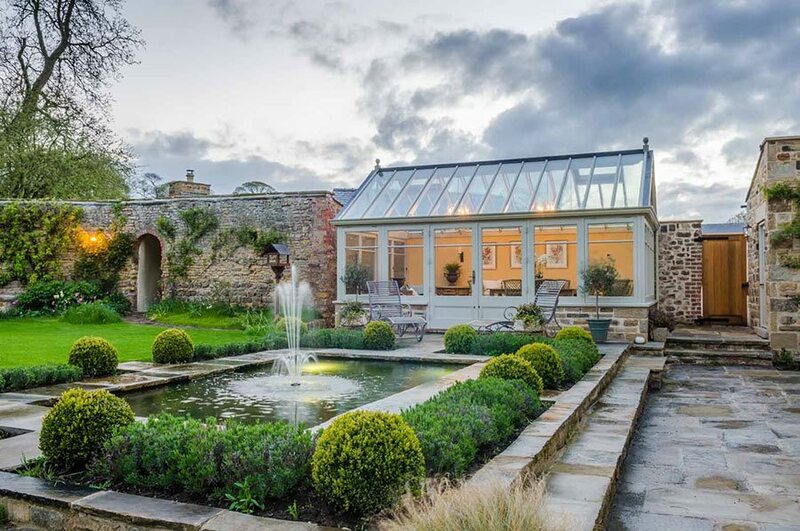 Too large a garden room will take over your garden – although to some extent, planning permission takes care of this because it doesn’t allow you to build over 50 per cent of the ground space. You also don’t want it to be so small that it lacks practicality. So, to make sure the space is the right size for you, think about how you plan to use it. The exterior of this L-shaped family room by eDEN Garden Room features an overhang that provides essential shade on sunny days. A similar garden room costs around £25,000. As you map out your plans, look carefully at access from the house and the proposed view. Don’t forget to think how the sun will affect it, and whether your neighbours will be able to see in. Bear in mind that garden rooms can be built on a slope, but you’ll need more ground work at the start. 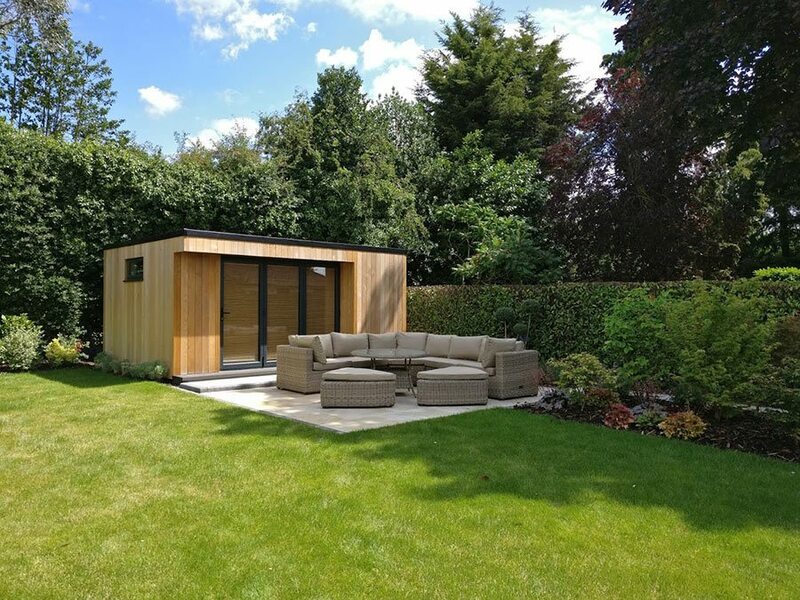 The key features of a luxury garden gymnasium by Swift Garden Rooms include air-conditioning, a wireless alarm system, a remote-controlled lighting system and integrated audio/visual system (all optional). A similar garden room costs around £33,300 (excluding options). If you don’t want to spend a long time maintaining your garden room, avoid timber windows and doors as they need frequent applications of paint or varnish. “We use aluminium windows and doors as they offer a stylish finish, don’t deteriorate in colour and don’t warp or move once installed,” Rachel says. Keep your garden room from overheating by using glass that’s been treated with a solar-reflective coating. “You can also have aluminium blinds that are installed inside the double glazing, which will help reflect some of the solar gain,” explains Martin. The added bonus of having blinds incorporated into the glass is that, unlike conventional blinds, they don’t need constant dusting. “Alternatively, consider an overhang or add a veranda to the front of the garden room to get some shade,” Martin adds. Commissioned to replace a long-derelict Victorian greenhouse, occupying the same footprint, this garden room was built in The Caulfield Company’s Yorkshire workshops in solid Sapele hardwood and painted in a soft green finish. Prices start from £35,000. Martin is receiving an increasing number of enquiries from people who want to attach a garden room to their house. If you want an affordable and quick way to extend your home, this could be it. “We can often do these in about two weeks flat,” says Martin. This is a simple solution, but it’s not suitable if you want to match your extension to the style of your house or you have a grand design in mind. The exterior of this simple garden room is clad in cedar. 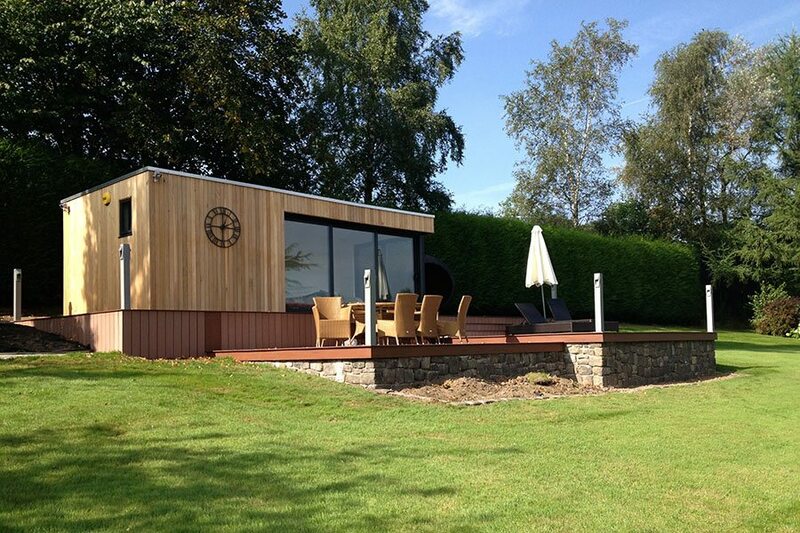 Designed by Swift Garden Rooms, it includes a small patio area for lounging. A building of this size and appearance is £28,800. Added extras will add costs but also comfort. Air conditioning will add around £1,800, for example. Underfloor heating or the addition of a bathroom can be expensive because of the connections to the mains.